The Red Charity Gala is an annual fund-raising event organized by philanthropists Kaye Tinga and Tessa Prieto-Valdes for the Philippine National Red Cross and Assumption High School Batch 1981 Foundation. It was my first time to attend this year, so I wasn’t sure what to expect. All I knew was that there was going to be an auction apart from the dinner, and that surely it was going to be a formal event. Thankfully, I had Sidney Yap to dress me up for the occasion, John Pagaduan of Shu Uemura to do my makeup and Bea Misa of Kiehl’s Stylist Series to do my hair. Sidney gave me two Francis Libiran gowns to choose from and I ended up wearing the more ornate one (better to be overdressed than underdressed). And what a gown it was! It was worn by none other than supermodel Tyra Banks after I wore it, so you can imagine how magical this was for me. 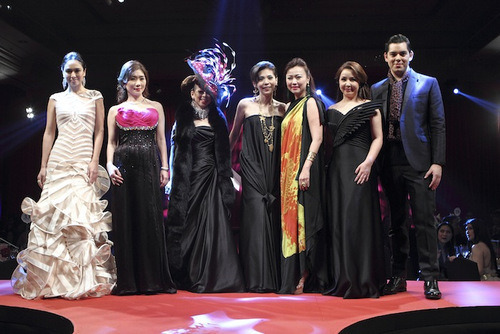 Francis Libiran is really a design genius! I had to cover the event once again for TRESemme All Access. In case you missed it, it’s a web series that brings you the best in hair and fashion, straight from the runways (haha that’s exactly the tagline in the webisodes, by the way). 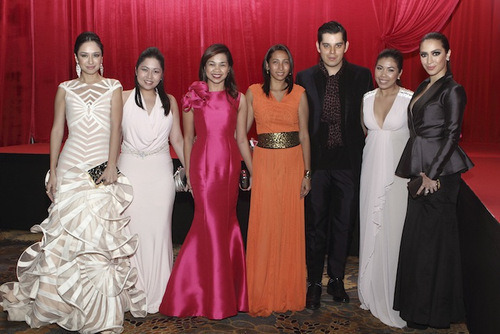 This time around, Liz Uy couldn’t join us, but Raymond Gutierrez was there, as well as the TRESemme Style Team. The event was entertaining, to say the least. The charity auction had more than a few patrons willing to donate or bid hundreds of thousands of pesos in the name of charity, on top of the tables they bought (it was a P10,000 per plate dinner). It was quite amusing to watch Tim Yap and Tessa auction off one covetable item after the other—the two were a very persuasive tandem! 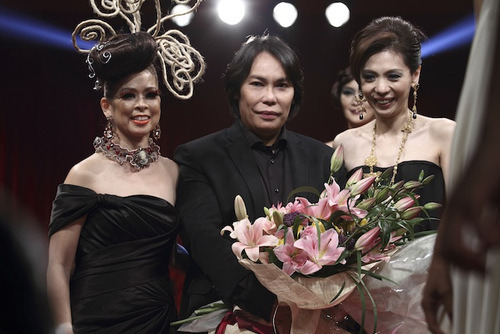 But for me, the highlight of the evening was the fashion show featuring Cary Santiago. Cary’s work never ceases to amaze me, as his designs are always so whimsical and beautiful. The collection we saw was elegant and refined, with excellent tailoring and pleating. We saw a lot of his signature origami looks and cut-out designs but these were not as flamboyant as his dresses in the past. I was able to interview him at the show and he told me he was inspired by the Rorschach ink blot test. 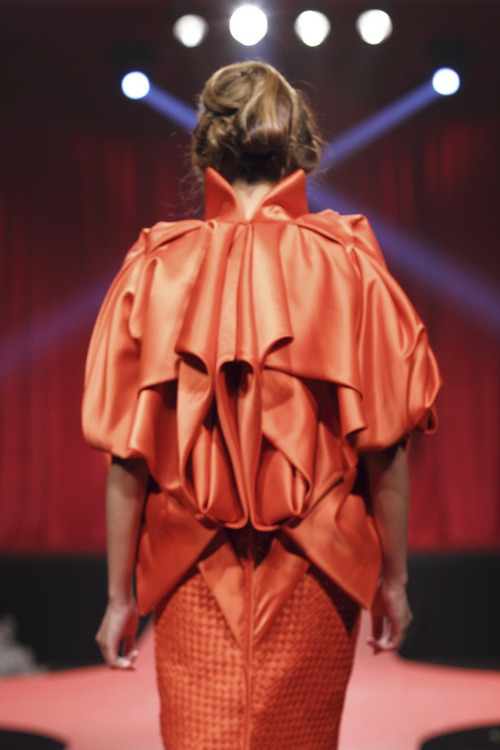 This explained why the collection was subdued and restrained, but was still able to evoke emotion and make a statement. I thought it was extraordinary! Here are photos from the event. Thanks to TRESemme and Visions & Expressions. 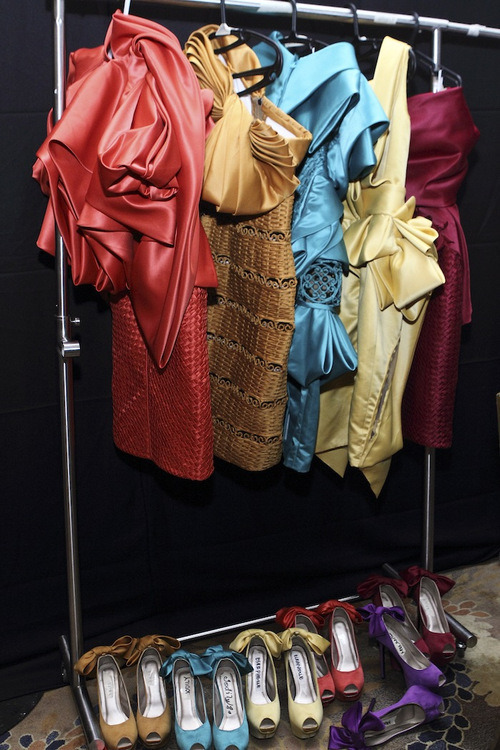 Backstage, taking a sneak peek into Cary’s latest collection. Satin heels for the show. Love the pretty bows! Cary’s work is all about the expert pleating. That basket-weave dress looks amazing. TRESemme hard at work, creating hairstyles for the show. And here is: the Francis Libiran dress I was talking about. I fell in love with it as soon as I saw it. 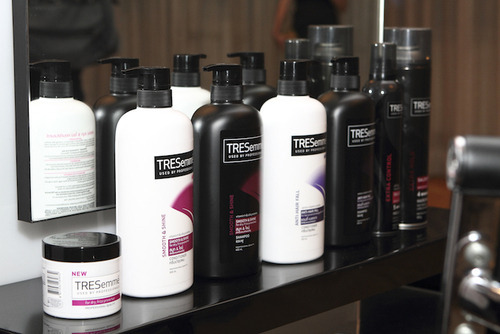 Here I am doing my spiels for TRESemme All Access. One last look at this amazing dress. With Unilever Philippines PR and Events Manager Nikki Abella. With Unilever Country Media Manager Macee Samarista and Nikki Abella. With the always stylish Tessa Prieto-Valdes. Tessa looking stunning in black. Singer/actress Pops Fernandez makes an appearance. Model and businesswoman Bea Soriano. 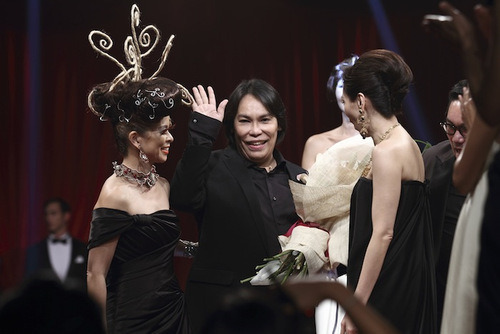 TRESemme’s Creative Virtuoso: Raymond Gutierrez. Mond’s date for the night: actress Carla Humphries. Lucky I was able to interview Cary before the show started. Cary and I share a laugh. I think I buckled when I did my interview: take two! One last pose with Cary before he goes off backstage. Kaye Tinga and Tessa Prieto-Valdes hosted the event. Mond and I went up the stage for TRESemme. 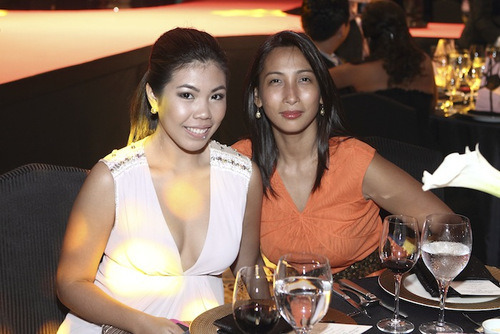 TRESemme Brand Assistant Manager Raiza Revillla with Nikki Abella. Actress and host Ruffa Gutierrez was spotted at the dinner. TRESemme Style Team’s Tinette Ozamis-Puyat. TRESemme endorsers: me and Mond. Tim Yap and Tessa auctioning off a Lancel bag. Items go to the highest bidder. A fashion show by Fila had Brapanese model/actor Fabio Ide walk the runway. 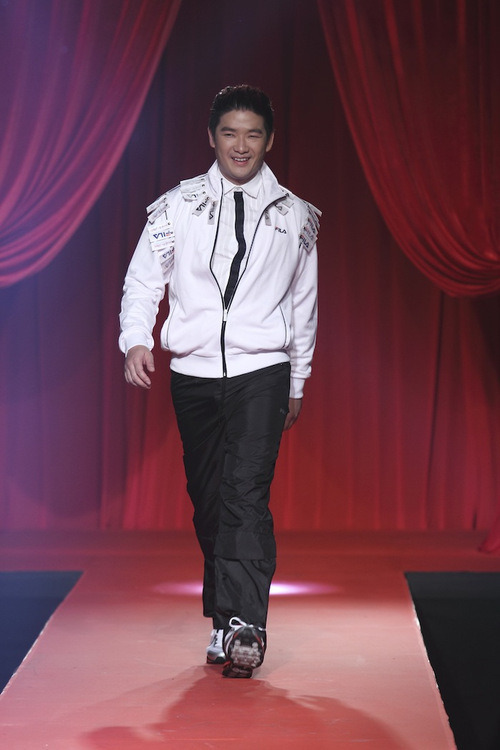 Tim Yap makes a quick change for the show. Stunning Fila endorser Georgina Wilson was there too. The Cary Santiago fashion show starts. Opening the show is supermodel Marina Benepayo in a white gown. This black and white dress resembles a peacock. Focus is on the bottom part of the dress. Clean lines from the front. All the details are at the back of the dress. More details in the back. One of my favorites. I love the way the fabric falls. Love the side slit, so unexpected. Finale dress worn by supermodel Grace Tagle. Cary dresses all lined up. Cary with Tessa and Kaye. TRESemme Style Team with Carla.